New for December 2010! We are finally going to tackle this subject. Come back later please, we're still working on this! Check out this unrelated topic, A Rough Justice! Surface roughness is often the answer to the question "where did all this loss come from? ", it can be a problem for thin-film networks and printed wiring boards alike. When we are discussing roughness, it is typically in the context on microstrip circuits. Roughness is a double-edged sword for sure, the rougher the interface between the metal and the substrate, the better the adhesion, but the higher the attenuation. A common mistake that new engineers make when they first hear about surface roughness increasing conductor loss, is that it's the a problem on the top surface of the metal in microstrip (the surface you can see). But as we all come to know, its the surface that you can't see that matters most. Wally: What in tarnation are you doing there, son? Pasquale: I'm trying to polish the metal on the top of my filter, and the gold is smearing everywhere! Wally: Where did you get the notion to do something foolish like that? Pasquale: Well, my X-band filter has twice as much loss as the simulator said it would, and Evita said it was because of surface roughness of the metal, and she's usually right. Funny, the metal didn't look rough under the microscope until I tried to polish it with the brillo pad! Wally: Well, she's always been right to look at I reckon! Say, where did you get the alumina for that filter? Pasquale: Eew, don't say that about Evita, she's older than my mom and her jewelry is so clangy! She must be pushing forty! But check out my new ascot... The alumina came from right here, it was a free sample, and it says 93% pure, unpolished. Is that good or what? Wally: It seems any fool can design a filter these days with that newfangled software. But it seems that this fool can't build one! Let me set you straight... but first, who the Hell is Ed Hardy and why are you wearing his jumpsuit? Surface roughness has a big effect on metal loss. When roughness becomes on the order of skin depth, attenuation of transmission lines increase. It's semi-predictable, however, there is no exact calculation of the effect, and surface roughness by itself is not easy to quantify into a single number. Although an RMS value is typically used, the geometry of the roughness is rarely regular or random. Indeed, the roughness could give way to anisotropic attenuation, as polishing marks may be more pronounced in the x-axis than the y-axis. So if you have five skin depths of metal, you have pretty much captured all of the conduction you can. Until you mess up the surface. The roughness of the conductor interferes with conduction. But it isn't as simple as integrating the conductivity of remaining, "non-rough" metal. RF currents seem to find a way up and down the hills and valleys. It's possible is to observe the attenuation of like structures of various roughness (roughni? ), and come up with an empirical formula for the increase in attenuation. delta is the RMS roughness. It is scary that we have to point this out, but the units for tan-1 should be in radians, not degrees... You'll notice that the equation can only increase alpha-c by a maximum factor of two, even if the roughness is greater than the skin depth. We don't have that reference (yet! ), but we'll guess that this was valid when the total thickness of the metal was many skin depths. 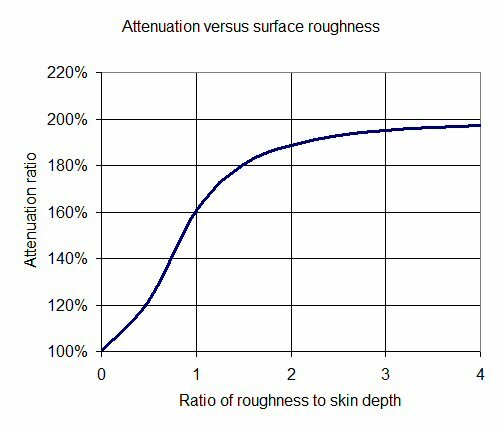 When RMS roughness is approximately equal to skin depth, conductor loss is increased by 60%. When roughness is much more than skin depth, conductor loss is 2X what is could be under ideal conditions (100% increase). Some entries are from Foundations for Microstrip Circuit Design by Terry Edwards, a Wiley book.